If there’s something all growing companies know, it’s that investment capital is crucial to bringing a business to fruition. Having overcome many of the challenges most growing firms do, the Canadian Securities Exchange (CSE) understands the terrain entrepreneurs can encounter in the journey to landing a successful deal. While important to the end result, getting the attention of investors is only the first step. With so much competition for investors’ capital and attention, however, successfully landing a deal starts by investing in compelling messaging and becoming a great communicator. Fortunately for issuers listed on the CSE, there’s a special event that can help deliver on all of the above. Building on the strong interest from the sessions in Toronto and Vancouver last spring, the CSE once again held CSE Day from sessions in the fall of 2015. These sessions took place in New York City, specifically at the OTC Markets headquarters as well as at feature locations in Toronto and Vancouver. Judging by the turnout, CSE Day events were once again, incredibly successful. With over 200 attendees spanning the investment industry spectrum, over 30 listed issuers participating in workshops and pitch presentations, and numerous handshakes and meetings arising from each session’s networking events, the CSE Days’ provided firms looking to raise capital the tools and opportunities they needed to craft compelling pitches and interact with deal makers. For the CSE, it is exactly this kind of sentiment from its listed issuers that continues to drive the Exchange for Entrepreneurs to build and implement a better model for public growth-stage companies. With the fantastic season of the Toronto Blue Jays not far in the rear view mirror, the lessons learned from great pitching are clear. Listed issuers who attended pitch sessions in Toronto, New York and Vancouver were treated to great tips from seasoned communications professionals. Marc Gordon of Fourword Marketing, Tony Herrling of Brainerd Communications and Taylor Thoen of BTV-Business Television, for example, gave the listed issuers in attendance the framework and feedback needed to craft their company’s story in a way that investors are most interested to hear it. 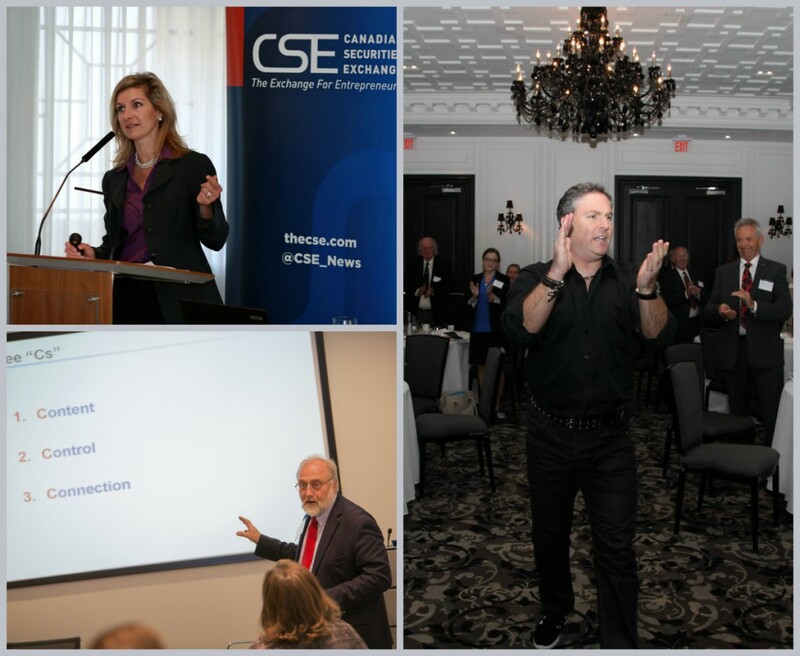 Taylor Thoen of BTV (top left); Tony Herrling of Brainerd Communications (bottom left) and Marc Gordon of Fourword Marketing (right) at CSE Day events in Vancouver, New York and Toronto. While being able to deliver a great pitch is essential, it’s not the only skill needed to win over potential investors. As any publicly listed firm knows, staying current on compliance and regulatory matters, especially those that directly impact raising capital can be crucial to navigating opportunities. Readers interested in accessing the presentations from this year’s events can contact Barrington Miller from the CSE here. Finally, CSE Day sessions also provided an opportunity for the CSE management team to recap the Exchange’s performance and highlight upcoming opportunities the CSE is hard at work on bringing to key stakeholders. The recap of key metrics showed the CSE that the market continued to vote with its dollars. Through the end of September the CSE saw over $122M raised by issuers, more than $14M compared to the same point last year; over 180 completed financing deals and the number of listings exceed 300 for the first time in the Exchange’s history. Trading volumes also remained strong. 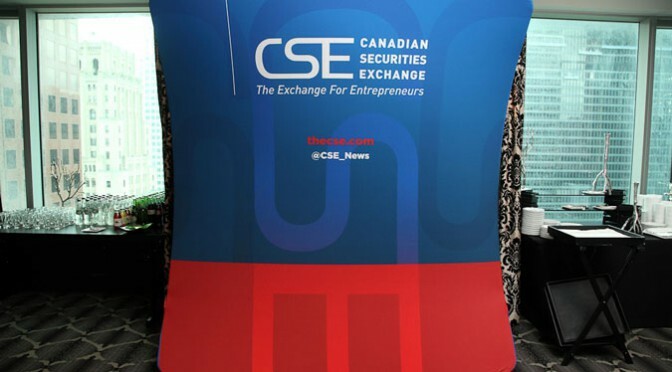 As CEO Richard Carleton pointed out, at one point during the past year, the CSE was the busiest Canadian stock exchange in terms of volume of shares traded – a signal that the marketplace is hitting its stride with investors of all sizes. As the CSE marketplace grows, it is also evolving. The CSE continues to seek out and encourage real businesses to consider the advantages that being public on the Exchange for Entrepreneurs brings. It is a message that continues to resonate with the entrepreneurial community. It’s not often that a triple bottom line gets met. For the CSE Day sessions, however, listed issuers, investors and the CSE collectively benefited from these events. By making the investment of time and knowledge in the firms listed on the Exchange, the CSE is optimistic that those companies can, in turn, improve their odds of landing the deals that help bring real businesses to fruition.